Tuesday’s mission follows up on four dual-satellite deliveries by Arianespace in 2017 in addition to a pair of Soyuz launches from the South American space center as well as two Vega missions. 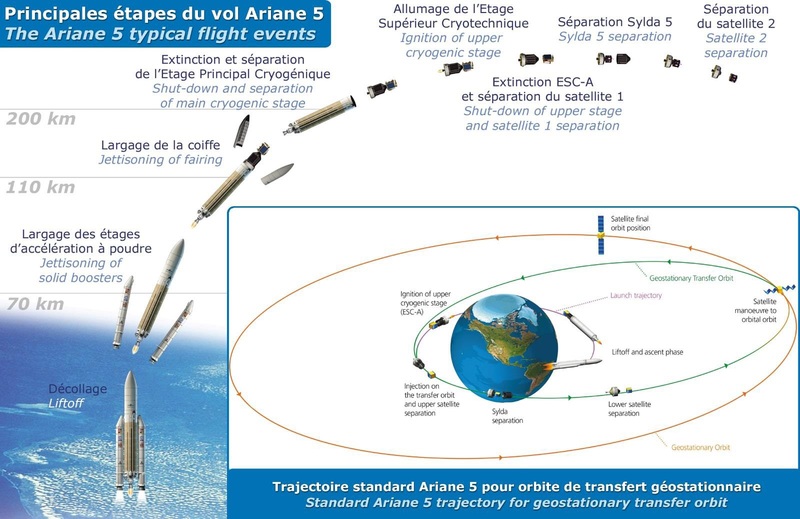 The VA239 mission is the last Ariane 5 flight to Geostationary Transfer Orbit planned this year with one more flight lined up for December using the Ariane 5 ES/Galileo variant to dispatch a group of four Galileo navigation satellites into Medium Earth Orbit. 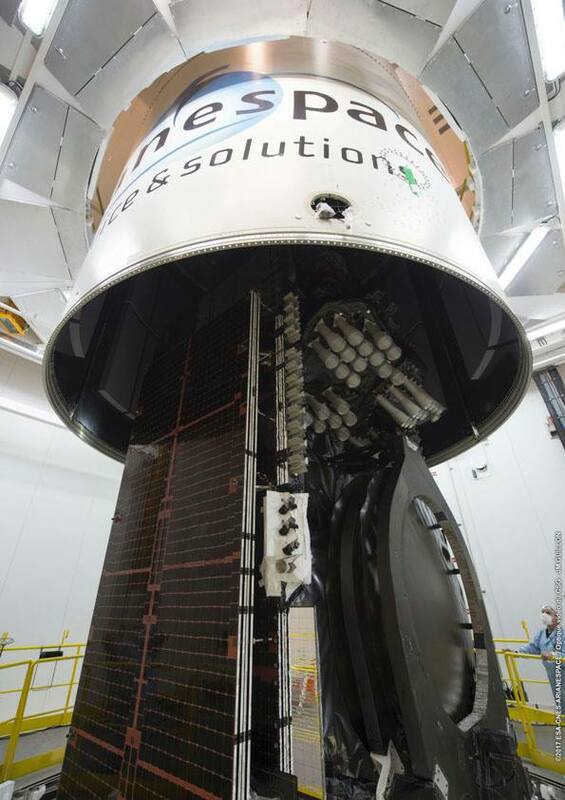 Additionally, Vega is set for its third flight of the year in November with an Earth-imaging satellite for Morocco. Tuesday’s Ariane 5 mission is carrying the 6,438-Kilogram Intelsat 37e satellite in the upper payload slot while the lighter, 3,520kg BSat-4a rides in the lower payload berth for separation 47 minutes and 15 seconds after liftoff. The Boeing-built Intelsat 37e will join Intelsat’s satellite fleet as the fifth in the company’s Epic-NG satellite series designed to deliver flexible communications on a global scale through the use of the latest advances in satellite technology including multi-band communications packages, frequency re-use and different beam widths to cater to services needing focused coverage for data-intensive applications and large-coverage area broadcasting services. Intelsat 37e hosts a tri-band communications payload with ninety 36-MHz-equivalent transponders in C-Band covering Europe, Africa, the Atlantic, South America and the Eastern U.S./Canada; 275 36-MHz equivalent Ku-Band transponders create 56 fixed Ku-Band beams over Europe, Africa and South America as well as portions of the Eastern U.S. plus a focused Ku-Band beam over Algeria and a steerable Ku-Band beam to direct additional coverage where it is needed; a single Ka-Band spot beam offers high throughput services with a total data throughput of 45Gbit/s across the satellite. 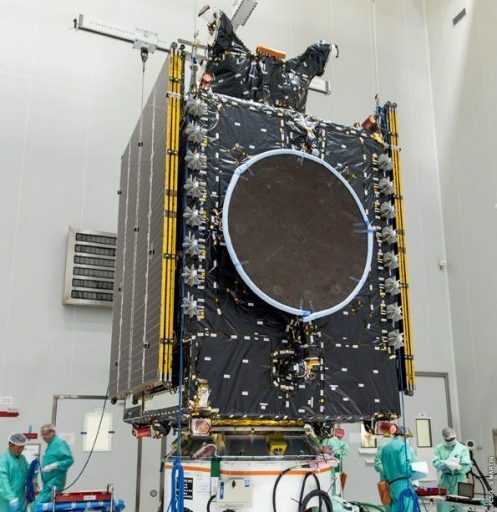 As the fifth in the Epic-NG constellation, Intelsat 37e is the first in the series to use advanced power-sharing capabilities and interconnectivity between all its communication bands. The satellite will operate for at least 15 years, replacing the 16-year old Intelsat 901 satellite at a position of 18°W over the Atlantic Ocean. BSat-4a, built by Space Systems/Loral for operation by the Broadcasting Satellite System Corporation, is an all-Ku-Band satellite for the sole purpose of Direct-to-Home television distribution to Japan and the Asia-Pacific Region. 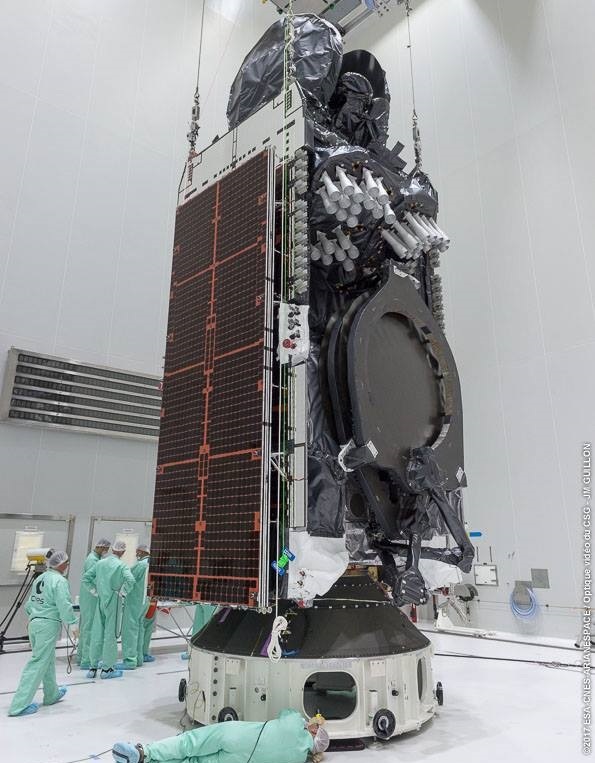 Based on the popular SSL-1300 platform, BSat-4a will spiral up into a position at 110° East where it will provide expansion and replacement coverage, eventually taking over from B-SAT’s first third generation satellite that launched in 2007. BSat-4a hosts 24 Ku-Band transponders for Direct-to-Home broadcasting in standard and high definition as well as 4K Ultra-HD and the advanced 8K resolution. The satellite was commissioned for a 2017 liftoff to provide the maximum margin between its liftoff and the 2020 Tokyo Olympics that are expected to the broadcast by the satellite in 4K and 8K resolution with B-SAT acquiring the necessary licenses for 4K/8K broadcasting in late 2015. 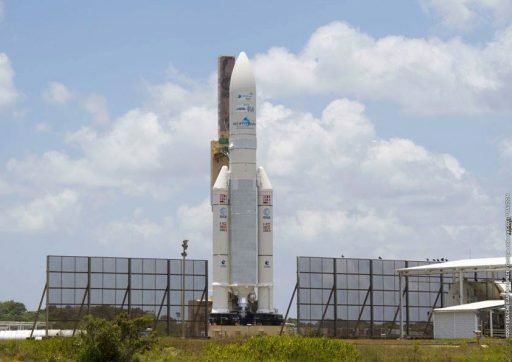 Preparations for this latest Ariane 5 launch campaign began in the second half of July when the MN Toucan, one of two sea-going vessels operated by Arianespace, arrived in French Guiana with the components of the Ariane 5 launch vehicle. Stacking of the vehicle was also in progress in July, starting with the installation of the 30.5-meter tall EPC Cryo Core on one of two operational launch tables followed by the attachment of the twin Solid Rocket Boosters that were assembled at a separate facility at the space base. Next was the installation of the ESC-A second stage, already integrated with the Vehicle Equipment Bay. The two satellites arrived in Kourou in the first week of August to undergo the standard pre-launch processing flow comprising a series of stand-alone tests and fit checks before the two passengers were loaded with propellants for their trip into Geostationary Orbit and stationkeeping over their 15-year service life. Combined with the adapters and the Sylda dual-payload dispenser, the two satellites create a total payload upmass of 10,838 Kilograms – a close second to Ariane 5’s heaviest GTO delivery earlier this year with a payload of 10,865 Kilograms. 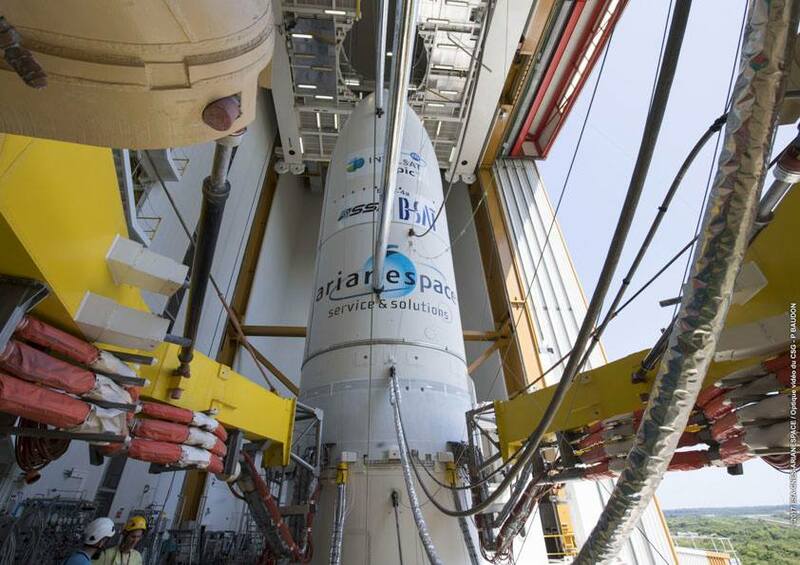 The two satellites took their positions on the Ariane 5 by August 29 with the 7.9-meter tall Intelsat 37e sitting atop the Sylda and BSat-4a, standing 5.1m tall, fastened to the launcher’s second stage and riding underneath the Sylda structure. Ariane 5 received its launch clearance on September 1st via a clean Launch Readiness Review and final arming was completed over the weekend and on Monday. The 55-meter tall launcher emerged from its Final Assembly Building on Monday and was set down on the ELA-3 launch pad for final close outs and charging of the rocket’s Helium pressurization system before entering an 11-hour and 23-minute countdown at 10:28 UTC on Tuesday with power-up of the launch vehicle expected at 11:18 UTC for an extensive checkout campaign. Propellant loading is initiated five hours prior to T-0 with the chilldown of transfer lines and propellant tanks before supercold Liquid Oxygen stored at -183°C and Liquid Hydrogen at -253°C are pumped into the two stages of the rocket. The 5.4-meter diameter first stage will enter propellant loading first at T-4 hours and 38 minutes followed 70 minutes later by the second stage. Loading of the rocket with 184 metric tons of propellant will take approximately two hours and tanks will be kept at flight level throughout the rest of the countdown. 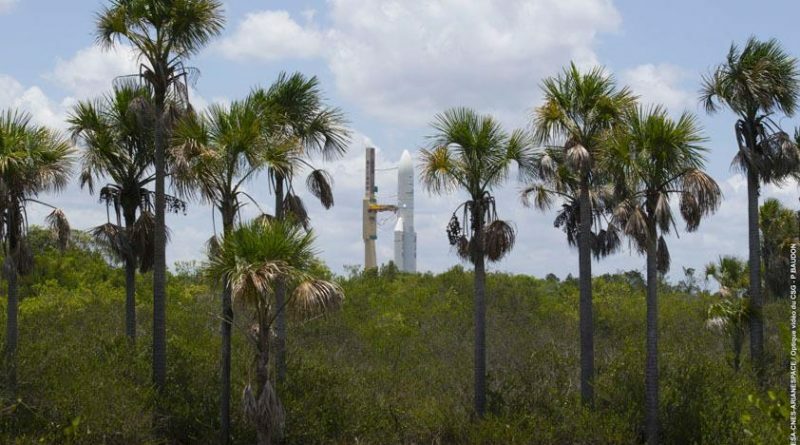 A repetition of telemetry checks occurs inside L-90 minutes ahead of the final set of preparatory steps to get Ariane 5 and all ground systems ready for the seven-minute Synchronized Sequence. Switching into fully computer-controlled mode, Ariane 5 will check off its final countdown milestones – notably the pressurization of tanks, the transfer to internal power, pyrotechnics activation and the handoff to Ariane’s computers four seconds before ignition. When clocks hit zero, the Vulcain 2 engine will ignite to soar to a launch thrust of 960 Kilonewtons with seven seconds of engine monitoring before the twin Solid Rocket Boosters are ignited – marking the point of no return. Upon ignition of the boosters, Ariane 5 will jump off its launch pad with a thrust of 1,420 metric ton force – balancing in a vertical posture for less than ten seconds before initiating its pitch and roll programs to align itself with a due easterly departure path for a quick flight across the Atlantic Ocean. The EAP boosters will deliver over 90% of the vehicle’s total thrust, each burning through 237 metric tons of propellant to help accelerate Ariane 5 to a speed approaching two Kilometers per second. Ariane 5 will push through the speed of sound just 49 seconds into the flight and experience maximum dynamic pressure just after passing the T+1-minute mark. The twin boosters will separate from the still-firing core stage at T+2 minutes and 22 seconds, using a pyrotechnic separation system to drop away from the rocket, headed toward a crash landing in the Ocean. With the boosters gone, it will be up to the Vulcain 2 engine to continue pushing Ariane 5 towards orbit with a vacuum thrust of 136 metric ton-force. The protective payload fairing will be jettisoned three minutes and 23 seconds into the flight when Ariane 5 will have departed the discernible atmosphere. Shutdown of the core is expected at T+8 minutes and 56 seconds with separation of the spent rocket stage seven seconds later to clear the way for the critical second stage burn. Ignition of the HM-7B engine will come four seconds after staging on a burn of 16 minutes and 25 seconds to push the stack into a highly elliptical orbit with a thrust of over six metric tons. The VA239 mission is targeting an orbit of 250 by 35,706 Kilometers, inclined 6.0 degrees with the upper stage aiming for an injection speed of 9.4 Kilometers per second. Powered flight will end at T+25 minutes and 31 seconds, marking the start of the complex ballistic phase to prepare for the separation of the satellites. Intelsat 37e will depart the Ariane 5 rocket 29 minutes and 50 seconds into the mission with the second stage swiftly swinging around to set up for the jettisoning of the Sylda adapter just two minutes later. BSat-4 – riding shotgun on Tuesday – will remain attached for another 15 minutes while the second stage maneuvers into the proper position for the release of the smaller of the two passengers at just over T+47 minutes to conclude the 95th flight of the Ariane 5 rocket.